I have been terribly remiss about posting to Perpetual Feast. It’s not that I haven’t been cooking, photographing, and yes, eating over the past many months, it’s just that I haven’t had time to write about what I have been cooking, photographing and eating. I have been trying to sell my house and buy another one across the country, both life-enveloping and time-consuming tasks. But I have folders full of recipes to clean out, both on my computer and at my desk. So, in the interests of cleaning my desk (and desktop) I am going to make an effort to post regularly. It has been miserably cold and snowy here in the inland Northwest. Although the snow on the ground is beautiful looking out over the countryside, the temperature hasn’t topped 30 degrees in weeks, descending to single digits (extra socks weather) some nights. This lamb curry, originally from Cooking Light, was a substantial and warming meal. It isn’t terribly hot, so if you like your curries incendiary, you can add some chilies or more red pepper when you are sautéing the spices. 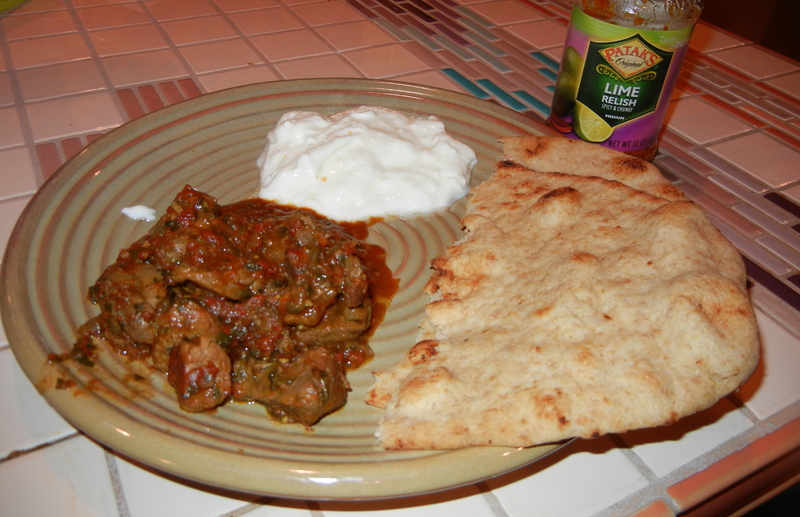 I first served the curry with store-bought naan – with non-fat yogurt and some spicy lime pickle. I have since eaten it over rice, and today, trying to use up what’s in the refrigerator, over leftover boiled potatoes (better than it sounds). The curry freezes well, and if you feel like you want a bigger serving, you can add some peas or green beans to it when you’re reheating the leftovers. Coat a large nonstick skillet coated with cooking spray and heat over medium-high heat. Add lamb, and cook for 5 minutes on all sides or until browned. Remove lamb from pan. Add the oil to the pan and heat over medium-high heat. Add onion and next 4 ingredients (onion through cinnamon); cook for 4 minutes or until onion is browned. Stir in coriander and next 6 ingredients (coriander through garlic); cook 1 minute. Add lamb, tomato, water, and salt; bring to a boil. 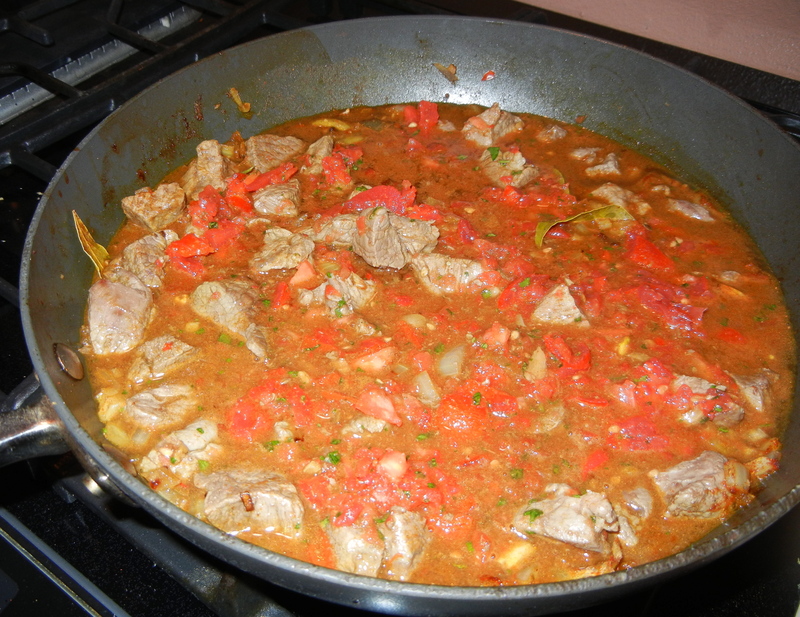 Cover, reduce heat, and simmer 1 1/2 hours or until the lamb is tender. NOTE: It was too snowy to go out and get tomatoes at the grocery, so I used an available can of diced tomatoes, drained and chopped in the food processor. It worked out great. SECOND NOTE: I thought it was strange to cook with whole bay leaves, cloves, etc. After the curry was cooked, I pulled these whole spices out and discarded them so no one would bite into one by mistake. The recipe didn’t say to do so, but you should. YET ANOTHER NOTE: You could also make this recipe with buffalo or with skinless chicken parts, lowering the fat accordingly. This is one of the best chicken curries I have ever made – or tasted. I made a three curry dinner for two friends. 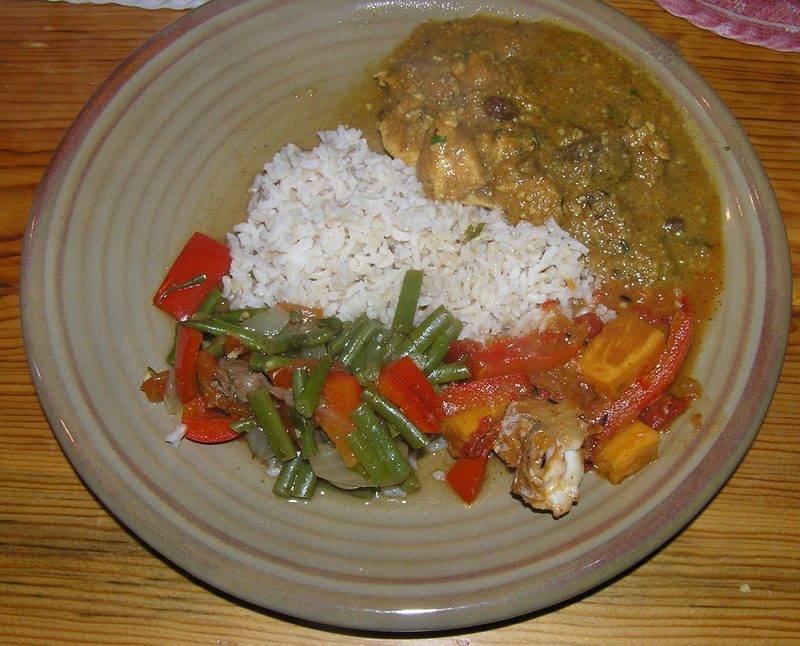 The curries are – from the top clockwise, Chicken in Cashew Nut Sauce, Indian Fish Stew, and Buffalo with Green Beans Curry, surrounding a mound of Brown Rice. More about the other curries at a later date. Despite the fact there was more than enough food, there was not a drop of this chicken curry left. 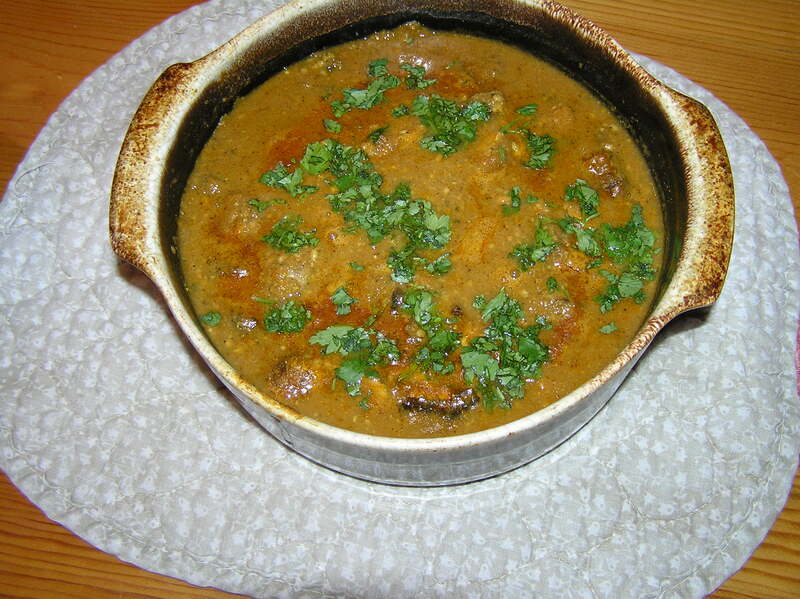 The sauce is rich, and thickened by the cashew nuts. It is not a particularly hot curry. If you want more heat, add a little cayenne pepper or chopped green chilis into the spice mixture, or do as I often do, have hot sauce on the table. The original recipe comes from Husain and Kanani’s Healthy Indian Cooking. I’m sure this would freeze well, if there was ever any left! Place onions in food processor and process for 1 minute. Add tomato sauce, cashew nuts, garam masala, garlic, chili powder, lemon juice, turmeric, salt, and yogurt and process for another minute or so. Heat the oil in a heavy-based pan. Lower the heat to medium and add the ground spice mixture from the food processor. Fry spices for 2 minutes, stirring occasionally and making sure that the mixture does not burn. When the spice mixture is lightly cooked, add half the chopped fresh coriander, the raisins, and the chicken cubes and continue to stir fry for 1 minute. Add mushrooms, pour in the water and bring to a simmer. Cover the pan and cook over low heat for 10 minutes or until the chicken is no longer pink and the sauce has thickened. Serve hot sprinkled with the remaining coriander. Serve with rice or couscous. Makes 4 servings at about 9.8 grams of fat/serving. I cooked this a few hours earlier in my large flat-bottomed wok, which I use for everything, and transferred it to a casserole for reheating in the microwave and serving. NOTE: Garam Masala means warm (garam) spices (masala). Most Indian households have their own mix, handed down from mother – or mother-in-law – to daughter, which is stored in a container for daily use. You can make your own mix from the many recipes available, or buy a good quality garam masala either at an Asian market or in the spice section of your grocery store. I often use the Spice Islands mix. Vindaloo is a curry dish from the western coastal area of India known as Goa. It is famously quite hot, and often somewhat sour or tangy. The dish was first brought to Goa by the Portuguese, and in its original format was a dish of pork with wine and garlic. The dish evolved into the vindaloo curry dish when it received the Goan treatment of adding plentiful amounts of spice. Potatoes were not usually common in vindaloo, but were added later as a means of stretching expensive meat (pork, lamb, or chicken) when the dish was served at celebrations. I really did not eat Vindaloo dishes in my Mumbai neighbors’ homes. Meat dishes were a rarity, although many of my neighbors ate fish, and occasionally chicken. Rather, vindaloo was something to be eaten at one of the many Goan restaurants in Mumbai. 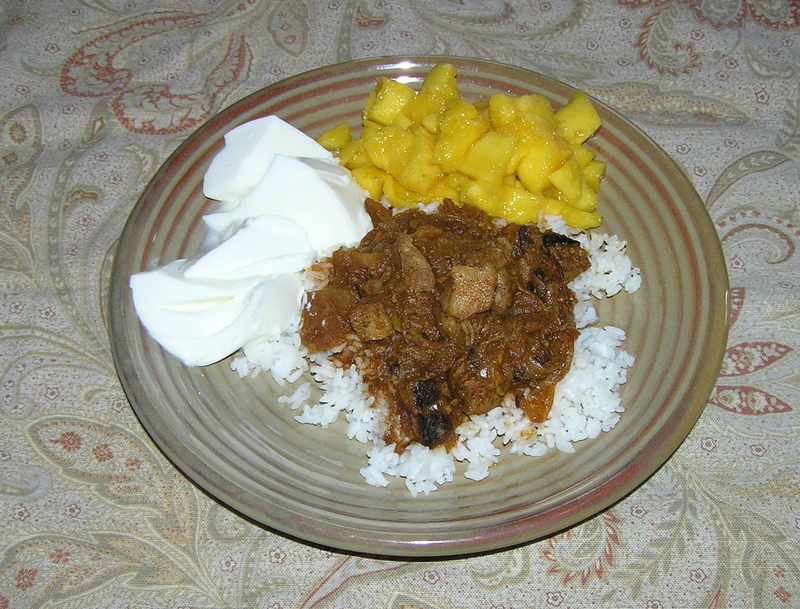 This pork vindaloo stretches a small amount of pork to make dinner for 4 when served with rice and perhaps vegetables. Although many recipes I have looked at cook it more rapidly on the stovetop, it takes well to the slow cooker where the long cooking allows the meat to become tender and the spices to blend. I did not make my vindaloo super hot, but use your discretion. Add more chillies and you can have an incendiary dish worthy of a corner Goan restaurant in Mumbai. 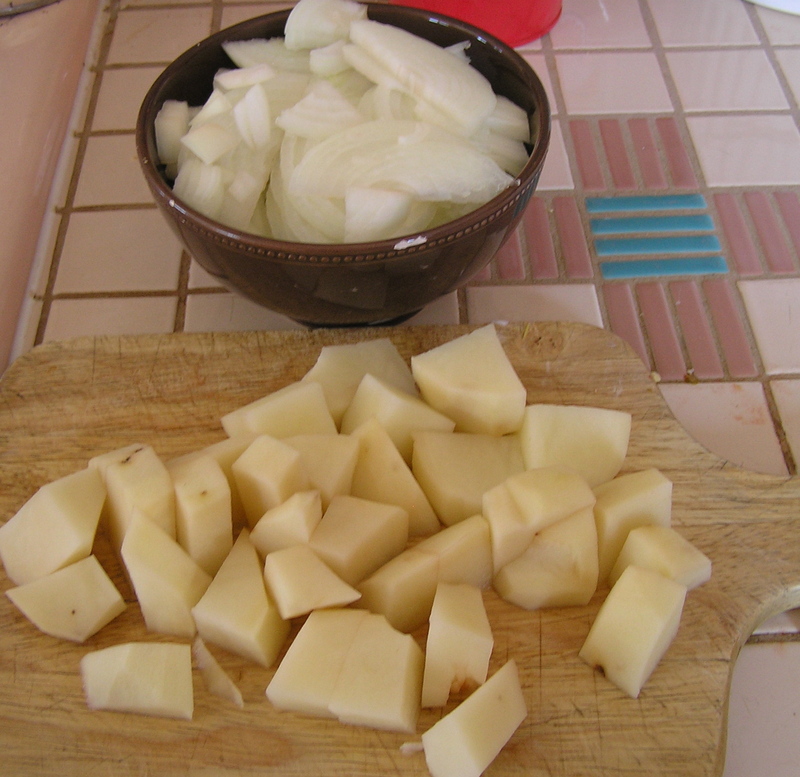 Place potato pieces and onions in the bottom of the slow cooker. Mix next 12 ingredients (malt vinegar through water) in a medium bowl. Add pork cubes and mix well. Pour pork mixture over potatoes and onions in the slow cooker. Cook on low for 4-5 hours, or until pork is tender. Makes 4 servings at 2 grams of fat/serving. Serve over rice. I served this with yogurt to cut the heat (a traditional Indian accompaniment) and with chopped mangoes. 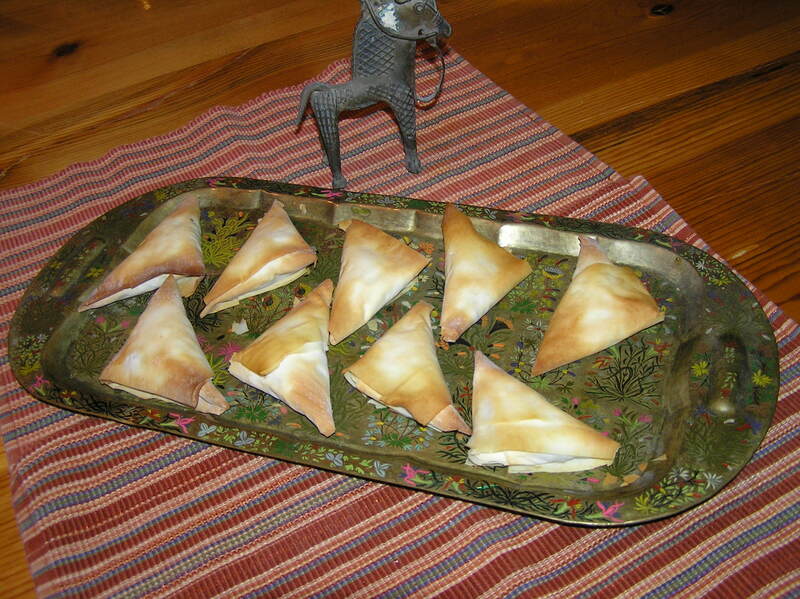 Samosas are delicious deep fried triangular pastries, typically filled with a savory filling, and served with condiments, such as chutney or spiced yogurt. The ones I am familiar with are found in India, although variations occur in the Middle East and Africa. 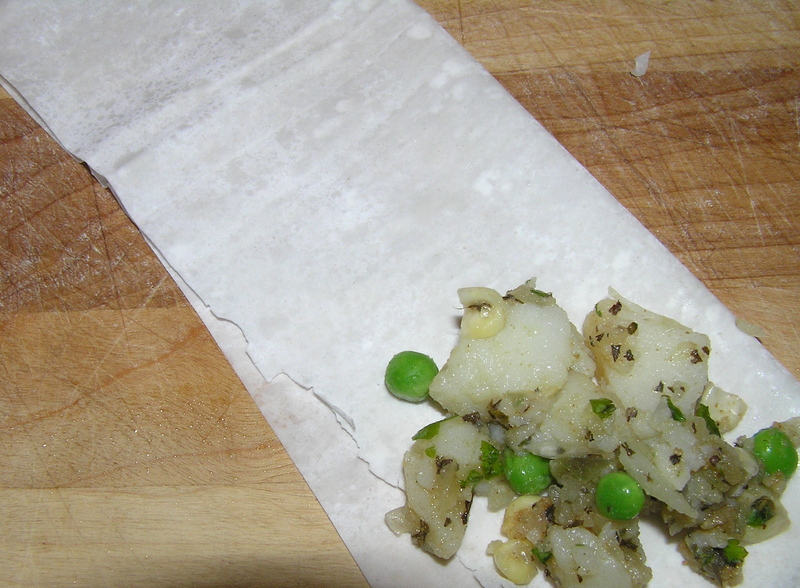 The filling can be any type of spiced vegetable, although potato was the most common filling I encountered in Mumbai. I have fond memories of snacking on crisp samosas, accompanied by hot tea, in little tea houses, and they were often served at weddings and other gatherings. My fondest memory of samosas, though, is eating them as a snack when I went out with a group of women on an excursion to the sari-blouse maker, or to buy spices in the bazaar. We would stroll along in our colorful saris, glass bangles jingling on our wrists, and pause to get a folded newspaper cone filled with plump, hot samosas from a vendor frying them in a cart along our path. Then we would take our savory snack to an open-air stall where raw sugar cane was being pressed into juice along with a bit of lime. There were, of course, flies around the sugar cane press, and I willed myself not to think about their being crushed with the cane as we sat around laughing, drinking our sweet cane juice and eating the hot samosas. I have made samosas before, but could not figure out how to lower the fat on the tasty deep fried snacks. But this recipe, from “Healthy Indian Cooking” captures the savory flakiness of samosa without deep frying. They’re relatively easy to make, too, although I found that they did not keep well for eating the second day. The flavor was fine, but they lost their crispness overnight and did not regain it when warmed in the microwave. So invite a friend or two over and eat them up right away. Preheat oven to 400 degrees. Spray a large baking sheet with cooking spray. Mix filling ingredients in a large bowl until well blended. Adjust seasoning to taste with salt and lemon juice if needed. (Note, I think I should have mashed the mixture more thoroughly so it wasn’t quite so chunky) Set aside. 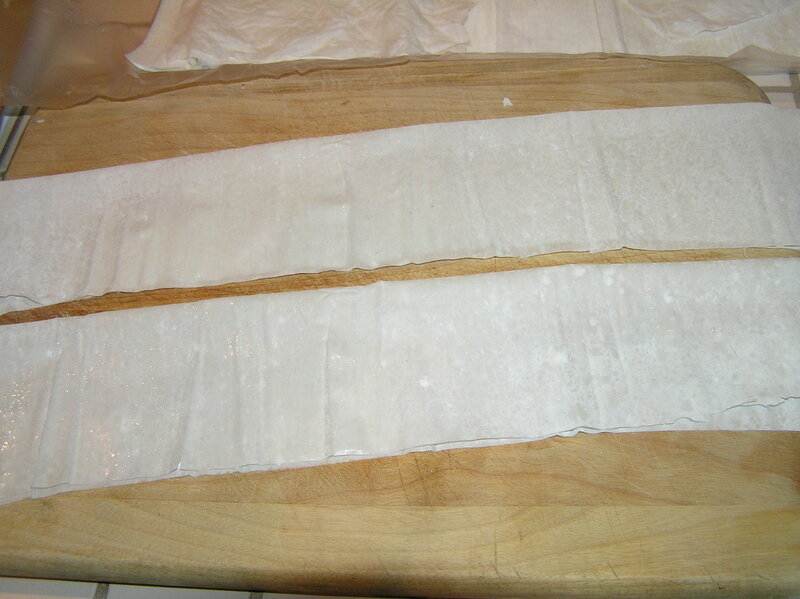 Cut each sheet of phyllo pastry in half lengthwise, then fold each piece in half lengthwise to make 28 thin strips. Lightly spray strips with cooking spray. 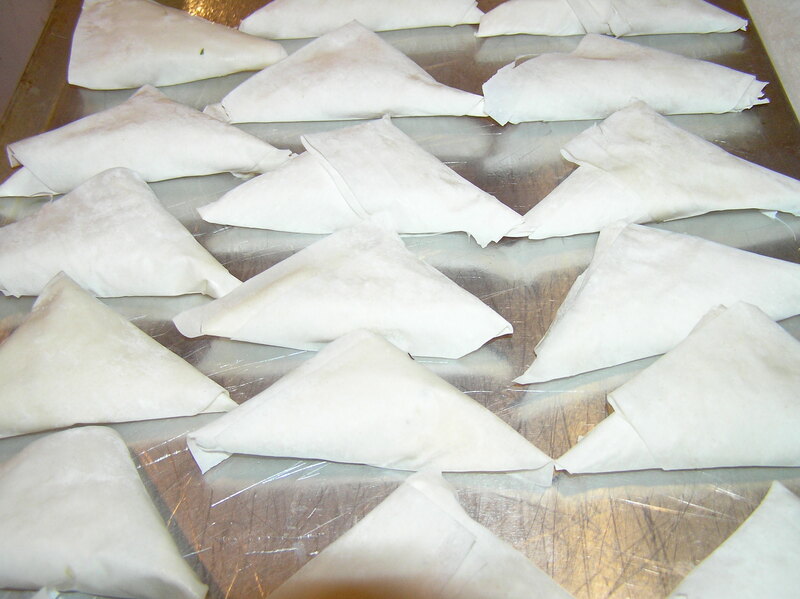 I found that it was best to work with 3 sheets of phyllo at a time, cutting, filling, and folding them (six samosas) rather than trying to do all the cutting at once, then filling, etc. Keep the pyllo sheets you are not working with covered with a damp towel to prevent them from drying out. Diagonally fold the pastry back and forth (like you fold a flag) to form a triangle shape. Place on the prepared baking sheet. Spray the tops of the samosas lightly with cooking spray (or brush lightly with oil). Bake in the oven for 10-15 minutes until golden brown. Make a cup of hot tea and enjoy. Makes 28 samosas at less than 1 gram of fat/samosa. Big Veggie Curry is what I call a foundation dish. 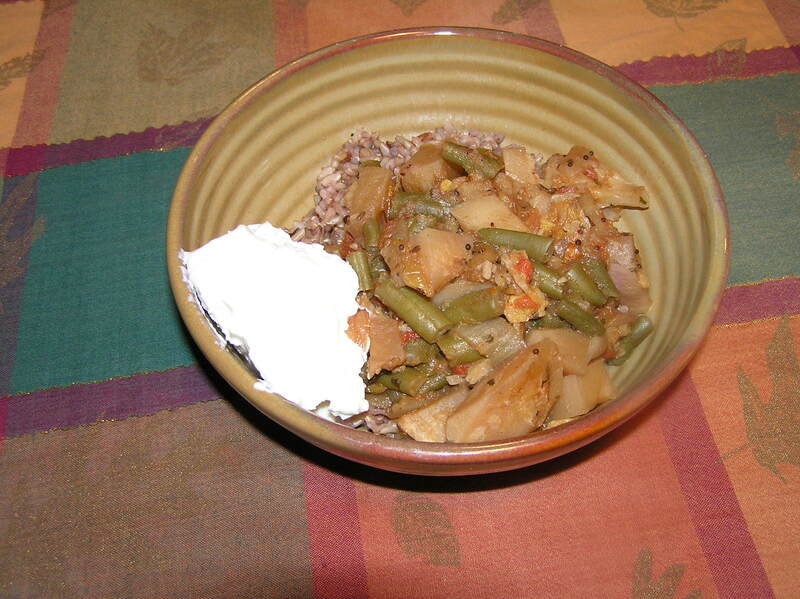 It can be eaten “as is” over rice, which makes a delicious low fat meal. Or you can add various things to it, such as shrimp or chicken. I freeze it in serving size containers to have on hand when I have a bit of leftovers that might mix in well. This curry is also a whatever-you-have-in-the-house recipe. I often make it when I am cleaning out the refrigerator and discover odd and ends of vegetable, or perhaps a bag of vegetables in the freezer that is getting old. One of the times I make this curry is when I’m about to travel long enough for vegetables to go bad when I am gone. I make up a pot of it, divide it in serving size containers, and freeze it, thus not wasting the produce and having something inviting to eat when I get back. In many ways, this curry is more like the curries my neighbors in Mumbai made on a daily basis – less a formal recipe and more a way of cooking, each cook adding her own touch to the process. Women would come back from the bazaar across the railroad tracks from our apartment building carrying a tote bag full of whatever was fresh in the market and combine it with onions and garlic and the spices that were the staples of the Mumbai kitchen. The beauty of this curry is that it doesn’t require specific vegetables or fruit. I sometimes add 1/2 a cup of raisins or some sliced peeled apples. This time I had half a bag of frozen cranberries left from an earlier dish, so I threw them in too. It was delicious. I don’t know why I didn’t think of it before. This is not a “hot” curry, although you could add a couple of peeled, seeded chopped jalapenos to it, or some red pepper. I tend to want to add heat when I am serving it if I’m in the mood, with a few drops of hot pepper sauce. Heat the oil in a large pot over medium high heat. Add the mustard seed and cook until you hear the seeds start popping. Add the cumin seed and garam masala and cook for about another minute, or until the spices smell fragrant. Lower the heat to medium and add the onion and garlic. Cook until the onion is soft, stirring occasionally. Don’t let it burn. Add a little of the broth if you need to to keep it from burning. Add the broth and tomatoes. Add the vegetables (and fruit if you are using it.) Bring to a boil, cover, and lower the heat. Cook for 1–2 hours until the vegetables are tender. The timing will depend on what vegetables you use. Stir in the cilantro and cook for 2 more minutes. This makes about 8 servings at 2 grams of fat/serving. This is served over brown rice mix, with Greek yogurt on the side. My vegetables this time were potatoes, cauliflower, a box of frozen green beans, a bag of frozen mixed vegetables, and half a bag of frozen cranberries. It rained yesterday – the kind of straight down, all day soaking rain under grey cloudy skies that chills you to the bone even if you are in the house. Cooking soup is a wonderful activity for cold, rainy days. There is something comforting about sitting at the kitchen table with the gentle bubbling sounds of soup simmering on the stove, and the smells of cooking onions and spices filling the warm kitchen air. And of course, a bowl of hot soup on a blustery day feeds the soul as well as the stomach. I’ve already made a big pot of bean soup, freezing most of it for future meals. I decided to try Mulligatawny soup, which I have eaten, but never made. Mulligatawny is a mildly curry-flavored soup of Anglo-Indian origin. Translated literally from Tamil, “Mulligatawny” means “pepper water”. Despite the name, however, pepper itself is not a vital ingredient. I never actually had anything like Mulligatawny soup in India. I expect it is actually a British interpretation of some Indian dish, made milder for the Western palate. Mulligatawny soup found its way into American cookery well before the Civil War. It appeared in the original Fannie Farmer cookbook of 1896. There are many variations of the recipe for Mulligatawny soup. Sometimes, the soup has a turmeric-like yellow color and is rather thick and creamy. That is the way I have experienced it in restaurants. I decided to modify the rather simple recipe in my Fannie Farmer Cookbook, which makes what I would call a thick, mildly curried, chicken vegetable soup. Melt the butter in a large soup pot. Add the onion, carrot, celery, green pepper, apple, and chicken. Cook over medium low heat for 15 minutes, stirring occasionally. Mix flour with curry powder and nutmeg, add to the pot, and cook over low heat for 5 minutes, stirring occasionally. Stir in the broth, parsley, and tomatoes. Partially cover and simmer for about 1 hour. Stir once in a while to make sure it doesn’t stick. Add salt and pepper to taste. Spoon some cooked rice into the bowl when serving the soup. (I did this the first time, and then mixed the remaining rice into the soup for later servings.) This makes 6 servings of soup at about 5 grams of fat/serving. Variation: There are many recipes for Mulligatawny Soup that have more ingredients and elaborate preparation. I chose the Fannie Farmer version because her recipes tend to be simple and doable. Most recipes seem to add cubed potatoes, which I think would be an admirable addition. I think you could easily add a few other vegetables as well (peas come to mind, although I’m not terribly fond of them). Other recipes add turmeric for a pronounced yellow color. I ate a bowl of the soup with a dollop of yogurt in it, which was quite good. This soup is not particularly spicy-hot, so those who want heat can add more black pepper, or a splash or two of hot sauce. I have a lovely cookbook “Healthy Indian Cooking”, which was published in England and has measurements in milliliters and the like – fortunately translated into our more familiar teaspoon and cup measures. It has charming turns of phrase, where eggplants are aubergines and zucchini are courgettes. It also has some translational hilarity, where one recipe tells you to make sure the cod pieces are well-coated in spices (look it up to find the giggles if it doesn’t make sense to you). Indian cooking as I learned it many years ago always started with large amounts of oil to cook the inevitable onions, garlic, and spices that made the “gravy” of curries. The authors of this book use much the same methods as I do to make their recipes low fat. They cut the amount of fat down, and use very lean cuts of meat. 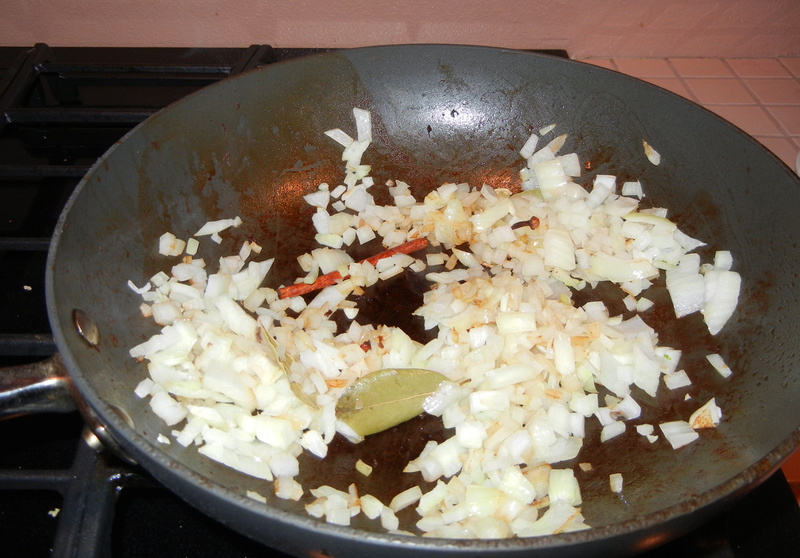 In cooking their recipes, I have often cut the fat even further by using cooking spray and “sweating” the onions rather than cooking them in fat, or using a teaspoon rather than a tablespoon of fat. The weather has turned unseasonably cold (is weather ever seasonable – but 17 degrees in early October is just plain wrong.) Cold weather has me thinking of turning on the oven to get warm. After baking several loaves of banana bread, I decided to find a baked Indian dish to make with the eggplant I just bought. This dish is quite festive looking. I recommend that you grind your own lamb, either in a meat grinder (more on meat grinding in a later post) or in the food processor. Don’t over process, though. You want lamb burger, not lamb pate. This dish also mixes a lot of vegetables in with the meat, making the dish not as heavy as lamb dishes can be. Also, it is not very spicy in terms of heat – not all Indian food is. But you could add a chili pepper or some cayenne pepper to heat it up. Preheat the oven to 350. Spray a baking pan large enough to hold the eggplant halves with cooking spray. Cut the eggplants in half and scoop out most of the flesh, leaving enough shell to hold the filling. (More about what to do with the eggplant innards shortly.) Be careful not to pierce the shell. Spray the outside of the shells with cooking spray. Spray a large saucepan (or wok in my case) with cooking spray. Add the oil and heat over medium high heat. Add the onions and fry until golden brown. Don’t let them burn. Gradually add the ginger, chili powder, garlic, turmeric, salt and ground coriander (I mixed them together in a small bowl before I started cooking). Add the chopped tomato. Lower the heat to medium low and stir-fry for about 5 minutes. 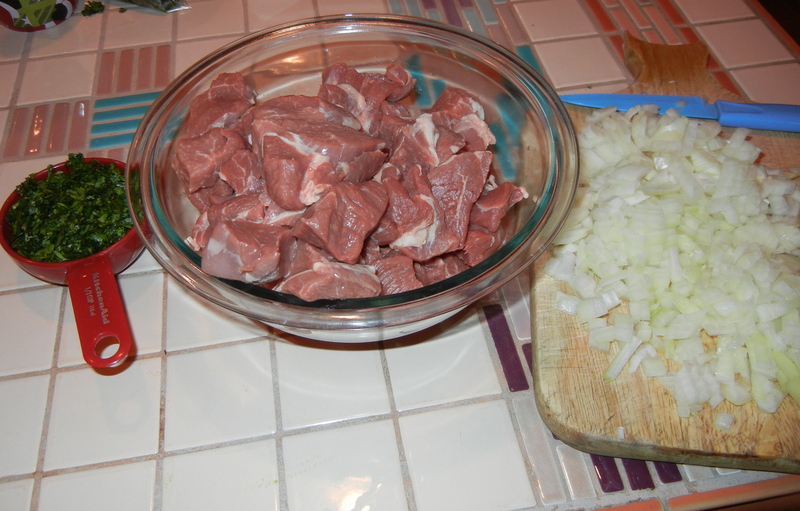 Add the ground lamb and continue to stir-fry for 7-10 minutes, or until the lamb is no longer pink. Add the chopped peppers and chopped coriander to the lamb mixture and cook for 5 minutes more. Spoon the lamb mixture into the shells and spray the outer edges of the shells with a little cooking spray. Bake until the eggplant has softened and the top of filling has browned. The recipe said that this would take about 25 minutes, but mine took almost an hour. I think maybe the eggplants I bought were larger than the British ones. Serve on a bed of plain rice. This makes 4 servings at about 8 grams of fat/serving. Variation: When I ate this, the eggplant was a little hard to tackle, although it looked really nice. So I wound up cutting the stuffed eggplant into pieces and mixing it with the rice. I wonder if you could just chop an eggplant and mix it in with the filling and bake it like a casserole? NOTE: I couldn’t find this exact cookbook, by Shehzad Husain and Manisha Kanani on Amazon. I got it at Costco quite a while ago. But there were similar books by these authors, written both singularly and together.